In 2014, with at least half an eye on the fact that it was soon to be the centenary of the Representation of the People Act 1918 which granted the right to vote to at least some women in the United Kingdom, myself and two fellow London Blue Badge tour guides began to discuss ways in which this event might be celebrated and brought to life for modern times. All of us had been struck, in the course of our work, by the paucity of stories about women’s achievements in the regular tours of London and indeed how often in those traditional histories women had a ‘bit part’ or played the role of victim to more powerful men. There were of course notable exceptions but these tended to centre on female royalty and it seemed to us there was a gap to be filled with stories of those women who played important roles in the fight for suffrage. Where better to tell those stories than in the actual locations where some of the most dramatic events took place? An idea formulated to combine our love of London’s history with the story of the suffrage movement to produce a ‘Theatrical Tour’ that brings those women to life. 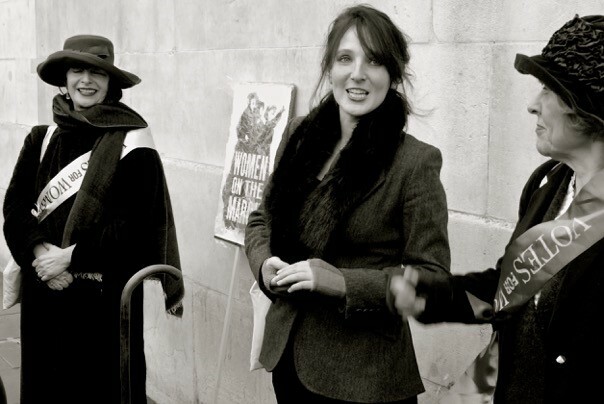 ‘Women on the March’ is the result, a lively journey, in costume, through central London. Our tour begins outside the National Gallery in Trafalgar Square where we meet Mary Richardson who, on the 10th March 1914, slashed Diego Velázquez’s masterpiece the ‘Rokeby Venus’ at least five times with a meat chopper, in a protest against the treatment of Emmeline Pankhurst. We also hear of other notable acts of damage to property by the suffragettes in the course of their struggle, including arson and bombings. We move through Trafalgar Square and hear tales from the many different groups that made up the suffrage movement and the difference between the suffragists and the suffragettes and their differing philosophies and tactics. There is an account of the 1907 ‘Mud March’ when Millicent Fawcett’s peaceful campaigners took to London’s streets for the cause. They risked, in Fawcett’s words, ‘being pilloried’ in the newspapers the next day. Only a year later ‘Women’s Sunday’ on 21st June 1908 even more women joined together from all over the country for the largest political gathering there had ever been in Hyde Park under the more militant directorship of Pankhurst’s WSPU. A cry of ‘Let’s go down the Strand’ sends us in that direction as we demonstrate (safely) accounts of the window smashing campaign in the West End and the campaign of arson and bombing targeting the Royal Mail. A group song (participation optional!) called ‘March of the Women’ composed by Ethel Smyth in a conveniently high key moves the group through Scotland Yard until we finally pause outside Downing Street to hear of attempts to petition the Prime Minister and the many reasons why women may not have won the vote, including the issue of male suffrage. Although the more militant campaigners sought publicity, they achieved it at a cost and using original accounts of women who endured it, we share the traumatic and humiliating experiences and abuse that women who were imprisoned for their part in the protests suffered. More drama unfolds outside the heart of British democracy, in Parliament Square, where we relive ‘Black Friday’, 18th November 1910, when a protest against Herbert Asquith’s decision that there was to be no more Parliamentary time for a suffrage bill, led to a brutal put down by the police. We huddle conspiratorily on the green outside Parliament and hear Emily Wilding Davison’s plans to hide in a broom cupboard overnight on the 2nd April 2011 and thus have her address registered in the 1911 census as ‘The House of Commons’ and we hear an eyewitness account of Derby Day two years later on the 4th June 1913 when Emily was to lose her life after being hit by the King’s horse. Using a copy of the banner kept inside the Parliamentary Archives we remind our marching companions that here, at the Palace of Westminster, another suffrage organisation, the Women’s Freedom League in 1908 chained themselves to the Ladies’ Gallery grille inside the House of Commons. The climax of the tour takes place outside Westminster Abbey where, in one of the later acts of protest, a bomb was set off on the 11th June 1914. While these deeds continued, we remind our fellow marchers that, if this sort of behaviour repulsed them, they had the choice to take up arms with the anti-suffrage campaigners led by the formidable Mrs Mary Ward. By August of 1914 Britain was at war with Germany and the militant protests stopped in favour of the war effort, although some notable campaigners became vocal pacifists. Our last stop is across the road, in Victoria Tower Gardens where we gather in front of the statue of Emmeline Pankhurst, who history has painted as the main figure in the suffrage movement. Here we also pay tribute to the less heralded women and men who contributed in various ways to the cause of women’s suffrage. It has been a privilege to help share this story. Young and old have responded in touchingly engaging ways with our tour and it is clear that 100 years after the first victory in the battle for women’s suffrage the story resonates as women fight on, in different but no less important ways. Come join the march!